In the history of modern music there has never been a more diverse decade of music, from punk to LA Glam rock, Electro Pop & dance to straight up raw anthem rock, the 80’s had it all. YES the decade of Decadence! Where excess was the accepted thing, where big hair, lycra, leg warmers, fluoro and big bands ruled MTV. The decade were indeed Video Killed the Radio Star! Where Iconic Superstars emerged to conquer world music Pop and Rock ruled the airways. 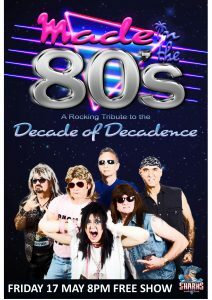 From Rock legends, Def Leppard, Bryan Adams, Bon Jovi, Guns & Roses, Duran Duran, the Eurythmics, INXS, Michael Jackson & Queen filled stadiums worldwide, along with Rock & Pop Divas Joan Jet, Cyndi Lauper, Blondie, Pat Benatar, Tina Turner, The Bangles name a few reigned supreme, the 80’s had it all! Now you can relive all the fun in this 3-hour show performed by “Made In the 80’s” a 6-piece band featuring gun musicians and boasting 5 lead vocalists, all led by the fabulous “Miss T”, one of the best rock Diva’s in Australia on lead vocals. This searing 6-piece band delivers to you some of the greatest Rock anthems and Pop Dance Classics of all time to emerged from the 80’s! Let’s get ready to Party!